is the currently accepted placement for Loxandrus by most North American carabid authorities. However, world carabid cataloguer Wolfgang Lorenz (2005) of Germany returned Loxandrus to its historically previous place under Pterostichini. I suspect American Terry Erwin in his forthcoming serial publication Treatise on Western Hemisphere Caraboidea - Pterostichini will continue to follow Lorenz. Until that is published, my mild bias for now is that BugGuide treat Loxandrus under Loxandrini. 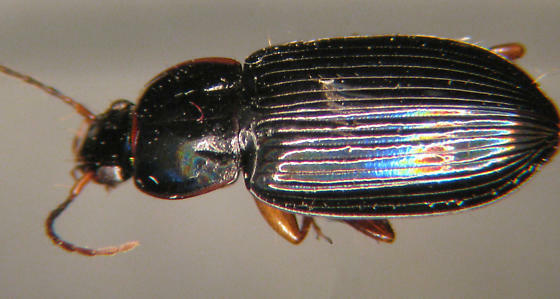 is suggested by the pterostichine habitus + dorsum strongly iridescent + elytra lacking a pair of scutellar striae. A genus notoriously difficult to separate species (especially females). rather than "pterostichine" habitus would have been better wording.